Being exposed to severe and harsh weather conditions, patios get filled with dirt and need professional cleaning. We can provide pressure washing on paved, tiled, stone and brick outdoor surfaces using advanced machines. The work is performed by trained, insured and reliable cleaning technicians who do it safely and qualitatively. Our services guarantee perfectly transformed and improved patios that will be at their best possible condition. Use our patio cleaning services that we provide to clients in and near Wandsworth SW18 to have perfectly washed pavements, slates and tiles. Our cleaning staff are supplied with advanced jet washing machines that use hot or cold water that had been purified and extracted under pressure. They ensure effective removal of smears, oily spillages, scuffs, weeds, moss, mould, algae and pollutants. Our technicians check the condition of the surfaces that need to be cleaned and apply hot or cold pressure washing. If you can’t provide access to hot water our staff will use cold water under high pressure to remove stubborn stains, weeds and moss. They can apply suitable detergents and sealants over the cleaned areas if the customer requires. 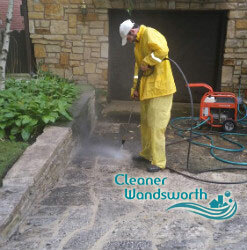 Our patio cleaning services can be used by the Wandsworth residents during all days of the week including the weekends and Bank Holidays. A great way to make your property more valuable in case you plan to sell or rent it out is to pressure wash its paved areas and patios. 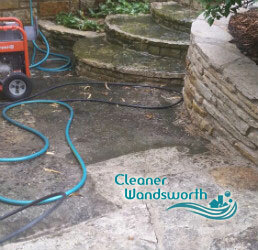 We can do this work for you using advanced jet washing machines that only need access to water and drainage. Our staff are trained to carry out effective and safe restoration of dirty, overgrown and unattractive patios. Call us or use our online booking form to schedule the patio cleaning, offered by our staff in SW18 and your outdoor house area will be pressure washed effectively and well.